Handstand push ups are the king of all push up exercises as they are the toughest and require good strength to start with. Master this move and your shoulder and arms will be strong and big. Handstands are as tough as they look. They build amazing strength in arms and shoulders, but you also need very good strength in arms and shoulders and flexibility in shoulder joint to start with. Stage 1 - Handstand Stationary - Learn how to build isometric strength first by holding yourself in handstand position before you do handstand push ups. A partner can help you get in the handstand position before you can do it yourself. Step 1: With your back to the wall, place your hands with palms down about 1-1.5 feet away from the wall. Step 2: Kick one leg up and then the other until you hold a handstand. 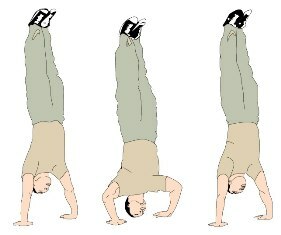 Step 3: Stay in the handstand position as long as you can to build isometric strength. Focus on your breathing. Breathe as naturally as possible. Once you have build sufficient strength in the handstand position and can maintain it for 1 minute at least try the handstand pushup. Execution: From the stationary handstand position, lower yourself until your head just touches the floor. Repeat this motion as in push ups. Your feet are resting on the wall. Aim for as many repetitions as possible. Disclaimer: Make sure you consult your physician before you try handstand push ups. Also try Hindu Pushups and other bodyweight exercises. If you want to have the best Body Body you want using Bodyweight Exercises then there is no better expert than Eddie Lomax. He describes excellent Bodyweight Exercises and Workouts in his Wonderful new e-book. Click here to find out more Bodyweight Exercises. Back from handstand push ups to weight training home.